The rise of on-demand marketplaces has brought with it varied business models, across number of industries. 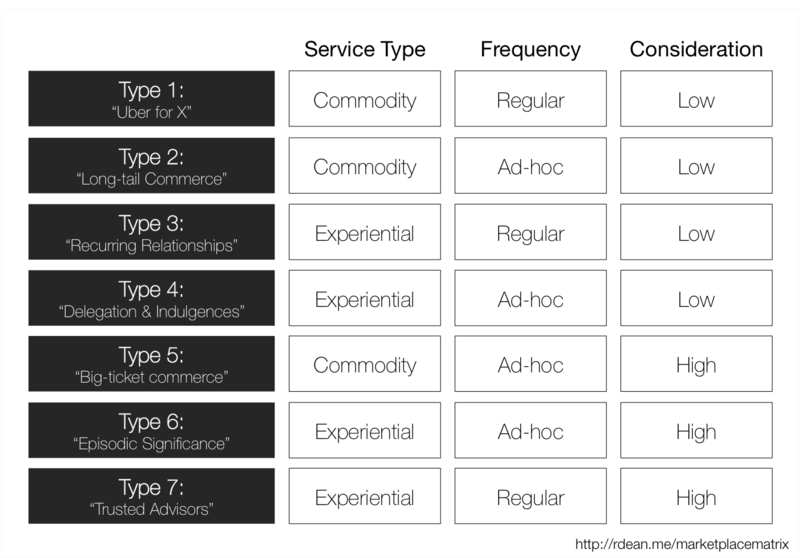 This framework helps to rationalize these differences into seven distinct marketplace design patterns, which help explains those differences, as well as strategies applicable for each. There are lots of frameworks & guidelines out there for building good marketplaces, from Bill Gurley, and even my own (not that I’m in the same league as Gurley), While these models are helpful in defining a market, and providing general tools for the service design, the nuances of the vertical a marketplace serves, has a strong impact on the variations we see in their business models. For instance, charging based on subscriptions or transactions, the level of the “rake”, supply or demand-side subsidies, the level of communication allowed between parties, and more. To understand this in more detail, I looked at a number of factors that uniquely defined various marketplace business models, in attempt to devise a set of dimensions. My thought was, if I defined a set of dimensions, I could map where a given marketplace fell among them, and therefore decide on the most applicable business model “playbook” for it. As I dug into this, it was quickly clear that many of my first dimensions depended on one another. So, I needed to isolate those that were truly independent, that would most fully express the broadest set of marketplaces into distinct “clusters”…a type of principal component analysis, if you will. I’ll spare you the details, and cut to the punch line with the three dimensions I concluded on. The first dimension is whether the nature of the good (or service) transacted is a “commodity” vs. an “experiential” one. While we can debate what makes up an “experience”, the rule of thumb I used was whether a user can have a reasonable assessment of quality, before experiencing the service. This is also a matter of degree — while you could make the case about Uber being an “experience” good, the quality variance is less than a marketplace for investment professionals. The second dimension is the level of consideration user initially invest, before they decide. It’s worth noting that this level of scrutiny, correlates with the level of trust, or risk, involved with the decision. To keep things simple here, I simply classified marketplaces into either “low” or “high” buckets. This last dimension is how often a customer repeatedly uses the platform. More specifically, the level to which we can “predict” that a user should return to platform regularly. Here, I use the terms “ad-hoc” for sporadic / episodic, use and “regular” for repeated use. Mapping each of these dimensions and values together, resulted in eight possible solutions (2 x 2 x 2), of which I found seven of them seemed realistic. Those seven categories, listed in increasing order of their inherent challenges, are given in the following figure. Let’s drill into each of these categories. This group has been the sweet-spot of the “On-Demand” economy, with Uber as its poster child. . The low consideration, recurring nature of it make for a low risk of disintermediation, and thus makes sense why its been a darling of venture investment & growth. This next category has seen many entrants in it as well; however, few have enjoyed the same breakout success. In this model, the higher effort expended in search, coupled with its regular nature, opens the platform up to a greater risk of disintermediation. Additionally, due to its experiential nature, quality concerns, and thus requiring the platform to offer exceptional customer support, is paramount to success — both of which are why in my opinion, Homejoy truly failed. In this category, the nature of the services tend to either delegate well-understood work (hence the low consideration), or discretionary like the in-home food / cooking category. The challenge for platforms here is to solve for ongoing engagement and reuse – which is why you’ll see either low price points, or subscription models (e.g. BlueApron). This category tends to lend itself we’ll toward larger purchases. As such, platforms often make up for their infrequent nature, with a rake on a large price, making their customer lifetime value still attractive. The challenge here is for the platform to stay top-of-mind with consumers, which is why you see television advertising as a strategy for marketplaces like Zillow and Apartments.com. Similarly, we’ve seen “lead-generation” models work in this category as well (like ApartmentList, LendingTree, and Mint.com). This category couples the challenges of high initial search with low, or irregular frequency of use. As such, platforms here may often use subscription models (e.g. Match, Sittercity, Angie’s List) as a mitigating business model. Another strategy is to try to “move down”the consideration continuum by packaging services into well understood buckets, instead of an “ask for anything” model (e.g. HourlyNerd, TaskRabbit). Another strategy we’ve seen in this domain is the rise of “concierge” services, backed by AI & humans, offering a more personalized experience to help expedite and tailor the search process for users. This last group is arguably the most challenging to build a thriving marketplace, as the extremely high initial search, coupled with regular in-person reuse, results in the highest risk of disintermediation than any other. Subscription models can work well for these marketplaces, especially when combined with other operational value to handle the ongoing management of the relationship (e.g. payroll services, CRM systems, online file vaults). Many of these models need the “supply-side” to drive the relationship, to help ease the burden on the “demand-side”, to help avoid disintermediation. Finally, lower rakes in this category are commonly used as another incentive to keep users on the platform, keeping churn low and the unit economics still attractive. This framework tries to explain how a marketplace’s vertical impacts its business model. While I’ve spent a lot of time thinking about this, this model is still very much a work in progress; much of the terminology, and its details, still need work. So, if you have feedback, please leave a comment, or contact me, and let me know what you think. Quick layover in Hong Kong. Just enough time to head into the city for some noodles and a short walk. My Blog is featured on Guy Kawasaki's "Alltop", as a top innovation blog.